Need a bigger backlog of games to work through? 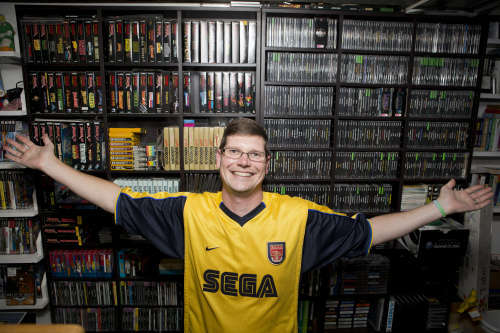 Michael Thommason is selling his 11,000-plus game collection, a treasure hoard officially recorded as the largest in the world by Guinness Records, on GameGavel. So 11,000 is a big number and all, but what do you get with that many zeroes? For starters, you get every game released in the US for the: 3DO, Action Max, AGP X-System, Atari 5200, Atari 7800, Atari Jaguar, Atari Jaguar CD, Atari Lynx, Buzztime, Captain Power, Game Boy Advance e-Reader, Neo-Geo Pocket Color, Nintendo Virtual Boy, NUON, Sega CD, Sega Saturn, Sega Dreamcast, Tapwave Zodiac, Tiger Game.Com, Turbo-Grafx-16 CD and Turbo-Grafx-16 Super CD. Finally, you can get that copy of Blue Stinger you always dreamed of! Thommason writes on his GameGavel listing that he is not exiting the hobby, but is selling his collection due to "immediate family and extended family that have needs that need to be addressed." As of this writing, the top bid is $50,000, with nine days left before the auction closes. For James ‘Shamus’ Hammons, Doom and a limbless, white-gloved cartoon mascot were all it took to ignite a longstanding obsession with Atari’s Jaguar. Back in the early ’90s, he felt he couldn’t abandon his Atari ST for IBM PC-style computing simply to play id Software’s genre-defining FPS, but then the news came that Doom would hit his favourite company’s new 64bit console. The real clincher came later, however. “I saw a preview of Rayman,” he recalls, “which at the time was going to be a Jaguar exclusive, and it looked amazing.”Today, Hammons – the lead developer of the Virtual Jaguar emulator – is just one of a growing scene of enthusiasts dedicated to sustaining consoles the world would sooner forget, earning them some respect for the niche they tried and failed to carve out. These emulator developers, amateur historians and digital archaeologists want you to remember Jaguar’s brief run at Nintendo and Sega’s dominance, and Virtual Boy’s daring attempt at 3D gaming almost 20 years too soon. And they’re desperate to preserve something of ambitious systems such as Nuon and Pioneer’s LaserActive, which were never widely known in the first place. The bragging rights of owning a vintage arcade machine are awesome, but the practicality of it – restoring what is likely a very abused machine, and the sheer physical space one requires – doesn’t appeal to a lot of people. [Jason] has a much better solution to anyone who wants a vintage arcade machine, but doesn’t want the buyer’s remorse that comes with the phrase, “now where do we put it?” It’s a miniaturized Ms. Pacman, mostly scale in every detail. The cabinet is constructed out of 1/8″ plywood, decorated with printed out graphics properly scaled down from the full-size machine. Inside is a BeagleBone Black with a 4.3″ touchscreen, USB speakers, and a battery-backed power supply. The control system is rather interesting. Although [Jason] is using an analog joystick, the resistive touch screen monopolizes the ADC on the BeagleBone. The solution to this problem would be to write a driver, or if you’re [Jason], crack the joystick open and scratch away the resistive contact until you have a digital joystick. A nice solution, considering Ms. Pacman doesn’t use an analog joystick anyway. Dinky, with red and white plastic casing and rounded edges, you’d be forgiven for thinking Nintendo’s defining video game system of the 1980s was a child’s toy. It’s no accident. Having achieved success with the Color TV Game 6 and 15 systems, Nintendo’s CEO Hiroshi Yamauchi wanted to design a more serious home computer disguised as a toy, one to appeal to the entire family: a family computer; or ‘Famicom’.The heart of the machine, based on a Motorola 6502 chip derivative, was nothing unusual. But the system’s controllers derived their shape and input dynamics from Gunpei Yokoi’s Game and Watch LCD games, while the inclusion of a microphone on the second pad showed Nintendo’s broadminded industrial creativity. But Yamauchi’s inventiveness went further than mere product innovation. In May 1983 he addressed a wholesalers’ group, the Shoshin-kai, stating that sellers of the Famicom should not expect to see large profits from system sales. “Forgo profits on the hardware,” he said. “It is just a tool to sell software. This is where we shall make our money.”The Famicom launched on July 15 1983 for just ¥14,800, around half the cost of rival systems. Within two months the system had sold over half a million units. Within six, disaster had struck. A bad chipset was causing a crash in certain games. Yamauchi, with typical flourish, recalled every system sold, skirting a crucial sales window in the Japanese New Year holiday, but protecting Nintendo’s name.Nintendo soon learned that software sold hardware, not vice-versa, and Yamauchi appointed a young Shigeru Miyamoto, designer of Nintendo’s first global arcade hit, Donkey Kong, to head a new game design research group, R&D4. Yamauchi recognized that artists not technicians made the best games and filled R&D4 with similar creative minds. The internal software division established itself as the most successful in Nintendo, launching Mario Bros. and The Legend of Zelda, triumphs buoyed by Gunpei Yokoi’s R&D1 group, which counted Metroid, Kid Icarus and Excitebike among its accomplishments.This feature is an extract from Simon Parkin’s book, An Illustrated History of 151 Videogames. However, by 1984 Nintendo faced a crisis. The company could not meet the demand with new games. Yamauchi was loath to open the system up to third-party developers, fearing that doing so would dilute the brand with poor games – the Atari effect. In late 1984 he yielded, granting the first three licences to Japanese game makers. The licences were restrictive. Nintendo took an unprecedented ¥2,000 per cartridge, and imposed a minimum order of 10,000 units per game. While many companies were dismayed by the terms, any misgivings were silenced by the size of the potential market. Hudson, one of the first developers to obtain a licence, sold a million copies of its first Famicom title, Roadrunner.While the Famicom’s rise to dominance in Japan had been smooth, the journey to the West was tortuous. Following a redesign to make the system look like a more serious computer, Nintendo renamed the machine the Advanced Video System and demonstrated it at the January 1985 CES show in Las Vegas. The reaction was disastrous: not a single order was placed.Yamauchi ordered another redesign and renamed the machine the Nintendo Entertainment System, while Nintendo of America’s Minoru Arakawa offered retailers a bold promise: the company would deliver machines and set up window displays for free. After 90 days, the retailer would pay for what was sold and return anything else they didn’t want. The offer broke down barriers and rebuilt trust with the games industry.Within three months the NES had sold 50,000 systems. Within a year, a million and within three years, three million. By 1990, Nintendo owned a 90 per cent market share of all video games in the West and, by 1991, the company was earning an average $1.5 million per employee, nudging past Toyota to become the most successful company in Japan. Almost single-handedly, Nintendo’s machine had resuscitated an industry. 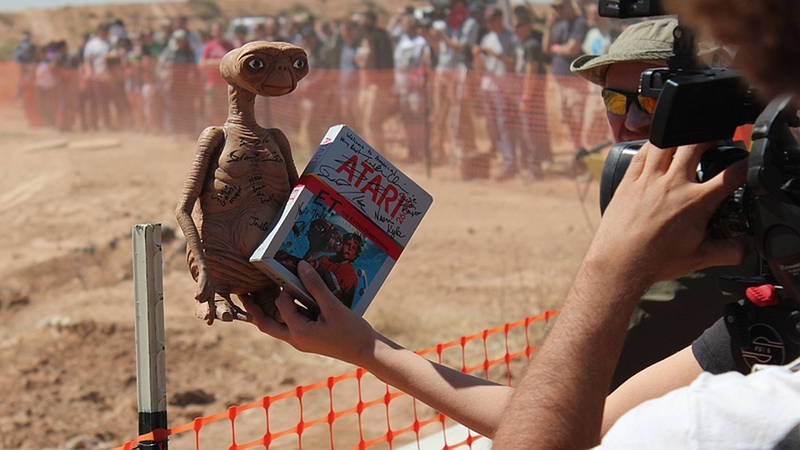 If you're in the market for a filthy yet arguably notable copy of the Atari 2600 debacle known as E.T., you may want to plan a trip to the New Mexico Museum of Space History. One month ago, Microsoft funded a dig in the Southwestern state in search of a fabled cache of E.T. cartridges reportedly dumped by Atari in the wake of the game's disastrous launch. After boring through 30 feet of human refuse, 1,300 of the cartridges were recovered. 700 of those historical artifacts will now be sold to the public, according to a decision by the Alamogordo City Commission. "We have been working with the space museum for curation, both for displaying and selling the games; they are now artifacts," Mayor Susie Galea told Polygon. "There are 700 that we can sell." It's currently unknown what price these unearthed cartridges will fetch, as Galea claims the city is still working to have the 700 pieces appraised. Once that's complete, they'll be handed over to the museum, complete with certificate of authenticity, just in case any enterprising New Mexicans hope to strike it rich by retrieving the more than a half a million E.T. cartridges that remain buried. The Magnavox Odyssey was the world’s first home video game console. Its Kubrick-esque logo and smooth curved white and black casing, like the dashboard of a newly born space shuttle, was pure science fiction, a far cry from the mythological poem from which it borrowed its name.And yet, what better word with which to launch both an entirely new entertainment medium and a reimagining of what was possible with the television set? An odyssey: a journey into the long unknown, a voyage fraught with danger and peril, wonder and triumph, the very same words that articulate the base appeal of the video game itself. Indeed, the Odyssey’s own journey to life started around such words, although, in this instance, the danger and peril were far from virtual.August 1938. Ralf Baer, a 16-year-old Jew, and his family fled Germany, three weeks before Kristallnacht saw the Nazis turn cold oppression to hot violence and genocide. Upon his safe arrival in New York, Baer studied television and radio technology, before securing a job at the military contractor Loral Electronics. It was here, in 1951, that Baer and some colleagues were asked to build a television set from the ground up. A piece of test equipment used in the building of the technology drew horizontal and vertical lines across the screen, filling them with colours. Baer could move these lines up and down and wondered whether the test should be built into the set, not necessarily as a game, but as something to do when the owner grew tired of the network television shows. The idea was dismissed by the team but Baer never forgot the concept.Fifteen years later and Baer’s career trajectory had taken him to head of instrument design at New Hampshire-based military contractors Sanders Associates. In August 1966, on a New York business trip, the seed of the idea he had in 1951 broke through the topsoil of his consciousness. While waiting at the East Side Bus Terminal after the day’s work, Baer started to formulate the idea for a game-playing device that plugged into a television set. The problem was that Sanders Associates only developed military technology, so Baer used his senior position to start work on the project, which he dubbed ‘Channel LP’, or, ‘Let’s Play’, in secret. Procuring a room on the sixth floor of his office block, Baer set Bill Harrison, a technician at Sanders, to work on the project. A few weeks later, Baer invited Bill Rusch to join as chief engineer, and the three men worked together in secret. Ralf Baer, developer of the Magnavox Odyssey. This feature is an extract from an Illustrated History of 151 Videogames. Baer took the prototype to Herbert Chapman, corporate director of research and development, who gave the team a $2,000 grant and five months to turn the idea into something marketable. But despite Baer’s small victories, Sanders was unable to find a company with TV expertise with whom to partner, and the project was placed on hold. In late 1969, Baer presented the Brown Box to a host of television manufacturers – General Electric, Magnavox, Motorola, Philco, RCA and Sylvania – in the hope that the similarities in components between the console and television sets would inspire one to jump on board. None did.Soon after, Bill Enders, one of the RCA execs who had been present at the meeting, moved across to Magnavox, and convinced his new employers to take another look at the system. Baer, Harrison and Rusch presented their machine again and this time Magnavox said yes. The TV manufacturer signed a preliminary deal in January 1971, before redesigning the casing and renaming the project Skill-O-Vision before settling upon Odyssey.The Magnavox Odyssey launched in May 1972, bundled with 12 games including Ping-Pong, the tennis game, which would inspire Atari’s Pong. To Baer’s dismay, his original price tag of $19.95 had ballooned to $99.95 but despite the tall cost, 200,000 consoles had been sold through Magnavox dealerships by 1974. With its wood panel effect frontage, and black, plastic- rimmed hood leading up to a retro-futuristic panel of orange-rimmed knobs and levers, the Atari 2600 is one of the most iconic machines of the late 1970s and early 1980s. Not only that, but the system provided a crucial step in the evolution of home gaming, taking the focus away from machines dedicated to a single game to a console that could play whatever compatible game was clicked into its cartridge slot.The machine was conceived by members of an engineering think-tank, Cyan Engineering, which Atari purchased in 1973 to specifically research and develop video game systems. Under the codename ‘Stella’, the team worked to create a complete CPU capable of reading whatever code was fed into it, a drastic move away from the custom logic-based hardware that was on the market at the time. However, work was slow and, in August 1976, Fairchild Semiconductor released its own CPU-based system, the Video Entertainment System. Atari was still some way off having a machine ready for mass production.Not only that, but the company did not have sufficient cash-flow to be able to complete the system quickly. Realizing they had to act fast, founder Nolan Bushnell turned to Warner Communications for investment, selling the company to them for $28 million on the understanding that work to finish Stella would be expedited. The next year Stella, initially named the Atari Video Computer System, later changed again to the Atari 2600 after its manufacturing part number CX2600, was released in America for $249. It had cost around $100 million to develop. Initially the reaction to the machine was lacklustre, the pressure of what looked like a grand failure resulting in the departure of Nolan Bushnell from the company in 1978. This feature is an extract from Simon Parkin’s book, An Illustrated History of 151 Videogames. The following year, however, through a combination of word of mouth and the release of a home version of Space Invaders, the machine gained widespread popularity, selling a million units in that year alone. With its 8-bit, 1.19 MHz speed processor and palette of 16 colours, the Atari 2600 was far from the most powerful console on the market at the time, technically surpassed by both the Bally Astrocade and Mattel’s Intellivision. However, Atari’s talent was in software development, and through a steady trickle of compelling, influential titles, the company began converting those who had previously eyed home gaming with scepticism into gamers. Originally intended by Atari to be a short-term product, marketed for one or two holiday seasons, game sales soon made it clear that home video gaming’s future lay in a software-led business model. Formative hits such as Pitfall!, Defender, Asteroids and Missile Command created a snowball effect in sales, with each success selling more hardware which in turn sold more software, an upward spiral of success that every video game hardware manufacturer since has sought to replicate.Ports of arcade titles sat alongside games based on licensed names such as Star Wars, G.I. Joe and James Bond, with each success story attracting the attention of yet another Hollywood studio or television company wanting to expand their empire into this brave, new frontier. However, by 1982 the system’s software library had reached saturation point, with developers having squeezed the potential from the machine by falling back on uninspired ports, such as Pac-Man, or substandard games, such as E.T. The Extra Terrestrial. With no Nintendo quality control system in place the ratio of good games to broken ones eroded consumer confidence in the machine and its library of games. In a few years, success had shifted Atari from a diminutive, agile, fun-obsessed outfit, to a dry corporation apathetic toward developing a follow-up to their once innovative hardware. In 1984 Warner sold Atari to Commodore Business Machines who immediately closed the game publishing wing. With it, the Atari 2600 died. The only vector-based home console with an integrated screen, GCE’s Vectrex remains desirable and iconic today, decades after its debut and subsequent decline. Where most systems of the era offered embryonic games with rudimentary visuals that have aged poorly, Vectrex’s brilliant white vector lines that light up its black screen like laser comets remain irresistibly chic.The system, on the market for just two years, was home to just 30-odd commercially available games. The Vectrex’s rise and fall exactly mirrored that of the wider video game industry, enjoying the boom success of the early 1980s before suffering the obliterating crash of 1984.The original idea for the machine derived from Western Technologies. One of the company’s employees, John Ross, bought a one-inch CRT screen, the type used in aircraft heads-up displays, in a surplus store. He brought it in to work with the idea of using the technology to develop a prototype handheld game. Kenner, best known for its range of Star Wars figurines, saw the potential and partnered with Western to build a prototype using a 5-inch screen, before promptly pulling out of the deal. Weeks later, GCE stepped in, changed the hardware design to accommodate a 9-inch monitor and gave the project the name ‘Mini-Arcade’. This feature is an extract from Simon Parkin’s book, An Illustrated History of 151 Videogames. By January 1982 the console was nearing completion but GCE had no games. Ed Smith, Western Technologies’ head of engineering, began to recruit students from Georgia Tech College, setting them the challenge to create 12 games by June that year. One staff member recalls visiting the warehouse at the time: “One programmer used to snort whipped cream gas all night while programming. [People would] trip on the cans when coming in for work the next morning. There were cases of them all over the floor. GCE management apparently put up with this…” The technique appeared to work. By April the games Mine Storm, Berzerk, Rip Off and Star Trek were all complete and, following a brainstorming session, the console’s name was changed to Vectrex.Despite the relatively high price point, the system sold well. In March 1983, the board game developer Milton Bradley bought GCE, just before the market crashed in 1984. MB reportedly lost around $31 million on the Vectrex as the bottom fell out of the market while Atari allegedly threatened to withhold their games and systems from any distributor that also carried Vectrex products.In recent years, the machine has enjoyed a resurgence of interest thanks to its unique graphical aesthetics. When it comes to vector-based game consoles, the Vectrex has no rival. If you long for a minimalist vector glow to light your living room, there is nowhere else to go. Clive Sinclair, known affectionately as Uncle Clive by his fans and followers, was the embodiment of the British boffin inventor with his bald pate, thin-rimmed spectacles, tidy ginger beard and his determination to retain freedom of action and choice. He built his company and reputation in the 1960s, by reverse engineering the latest, most expensive consumer electronics and releasing his own versions at a fraction of the cost of the originals.By the early 1980s he’d enjoyed a rich mixture of successes and failures: while his pocket calculators had turned an exclusive technology into a ubiquitous one, his digital Black Watch had almost brought about bankruptcy through defective returns. Sinclair’s approach to business was that of the purebred inventor, with his ambition for each invention straining no further than hoping to fund the next.It was from the ashes of another of Sinclair’s failures that his greatest success was born, one that kick-started the British video game industry and inspired the first generation of so-called bedroom coders. By the early 1980s Sinclair was no stranger to home computing. His ZX80 machine, with its extraordinarily low price point of £99.95 (£79.99 if the consumer optedfor the kit version, which they could solder together themselves), had brought computing to the masses, fast becoming the UK’s biggest-selling home computer. While the Commodore PET and Apple II were still prohibitively expensive, the ZX80 and its more powerful successor the ZX81 were affordable to most households, and the first British-developed games began to appear. [Carl] got his hands on a dead Sinclair ZX Spectrum +2A. He decided he wasn’t just going to fix it, he was going to improve it! The ZX Spectrum Compact is literally a “sawn-off” Spectrum +2A. [Carl's] inspiration came from a similar mod at the Old Machinery blog. Amstrad seems to have had a habit of bolting on additions to their products. In the case of the Spectrum +2A, it was a tape drive. Tapes weren’t a great storage method in the 80′s, and today they’re downright annoying. [Carl] didn’t need the tape interface, as he’s using a DiVide ATA interface. With the motherboard modified to fit the abbreviated case, [Carl] was ready to begin reconstruction. He glued the cap onto the sawn-off case with Grip Fill glue, which also served to fill any gaps. Some sanding, priming, and painting later, The ZX Spectrum Compact was finished. This isn’t a perfect mod, as the gap is still slightly visible under the paint – but it’s good enough for [Carl]. Hey, it’s good enough for us, too – we can’t all be[Ben Heck]! Gamers of a certain age will probably remember Descent, a game that combined first-person shooters with flight sims in a way that has never really been replicated. GameSpot has an article calling for a new entry in the Descent series, and it reminded me of all the stomach-churning battles I had as a kid (when the game wasn't bringing my 33MHz 486 to its knees). 'Here's where modern gaming innovations make Descentan even more tempting reboot. From the two-dimensional mines of Spelunky to the isometric caves of Path of Exile, procedurally generated levels help deliver fresh experiences to players in a number of genres. The mines of Descent would be perfect candidates for such creation, and they wouldn't have to be limited to the metallic walls and lunar geology of past Descent games. Imagine exploring organic tunnels carved by some unknown alien creature, or floating past dazzling crystalline stalactites in pristine ancient caves. Perhaps the influences ofRed Faction and Minecraft could also come into play as you bored your own shortcuts through layers of destructible sediment. All of Descent's dizzying navigation challenges could be even more exciting with the immersive potential of a virtual reality headset like the Oculus Rift or the Sony Morpheus. Feeling the mine walls close in on you from all sides could get your heart racing, and turning your head to spot shortcuts, power-ups, or delicate environmental details could greatly heighten the sense of being an explorer in an uncharted land.'" We love old video games, but we hate the way analog interlaced video looks on our new LCD monitors. [Michael] feels the same way, so he’s created NeoVGA, A Neo Geo Line Doubler in VHDL. Neo Geo, like many classic consoles, didn’t use the full resolution of an analog TV. In NTSC mode, it ran at 320×224 pixels. PAL users got an extra 32 vertical pixels for 320×256 pixels. The system ran with an approximately 15kHz horizontal sync and ~60Hz vertical sync. This is not exactly a VGA compatible signal, so it would be relegated to composite or S-Video capable displays. The signals looked pretty good on a CRT, but on an LCD, they tend to look crummy. Modern LCDs don’t natively handle interlaced and/or low resolution input signals. The TV’s controller performs the magic of buffering, interpolating, and transforming the input signal to be compatible with the LCD panel. As [Michael] explains, most of these algorithms are optimized for TV video signals with lots of motion. They perform poorly on static high contrast images such as the background of a fighting game. TV controllers also add lag to the signal chain. Not much of a problem when watching movies, but it’s a big problem when you’re trying to pull off that triple hit combo. The notorious Mega CD title Night Trap will be re-released in the future, its co-creator has confirmed. James Riley, who holds the rights to the game, told the closed Night Trap Facebook community the news earlier today. The community has been trying to persuade Riley to re-release a remastered version of the game or sell the rights to someone who will, in the hope that they can play an improved version with better quality video no longer affected by the heavy compression used in mid-90s FMV games. "I appreciate your on-going interest," Riley replied, "but please understand I do plan to re-release Night Trap and have been talking with a number of interested parties to do so. However, the specific platform(s) have not been confirmed (including online) and I will let you know once we have a definite plan and release schedule. "Night Trap will come back, in better resolution and game play than before, we just want to be sure it's the best strategy for all involved." Night Trap gained notoriety in 1993 due to its full-motion video graphics and its premise of a group of teenagers in a house being stalked by vampire-like creatures called Augers. It was one of the main games that led to congressional hearings on violent video games, and the subsequent creation of the ESRB. Anyway, some of the games were actually pretty good! But who wants to store a system for every individual game? [Sharon] decided to make the ultimate portable console — and jammed every plug and play console… into cartridges for safe keeping! Wait what? [Sharon] took 12 of the plug and play consoles, hacked them to pieces, and managed to stuff the guts into custom game cartridges she made herself. She then made the HandyPNP, a “base console” with buttons and controls, video output and an LCD screen. She meticulously mapped out every consoles’ controls, and wired them accordingly, so when you plug the cartridge into the HandyPNP, it’s like your playing the original system. It’s probably one of the most impressive handheld console hacks we’ve seen in a while, just considering the amount of work required to convert one console, let alone 12, to a standard connection for the HandyPNP to communicate with. Stick around after the break to hear [Sharon] explain the project herself! Unlike the few Commodore MIDI cartridges that are available, [Frank]‘s Kerberos has MIDI In, Out, and Thru, controlled by the 6850 ACIA chip, just like the old 80s interfaces. This allows the Kerberos to interface with the old Sequential Circuits, Passport, and Datel software. He’s offering the Kerberos cart up on a crowdfunding site, so if you’d like to grab your own, have at it. Nowadays, "basic" has a very different and derogatory Urban Dictionary-style meaning. Fifty years ago on this very day, however, it was the name given to a new computer-programming language born in a Dartmouth College basement. Devised initially by a group of the school's undergraduates and professors, BASIC's initial academic purpose was simple: to enable time-sharing on Dartmouth computers with an easy-to-learn, English-based language. 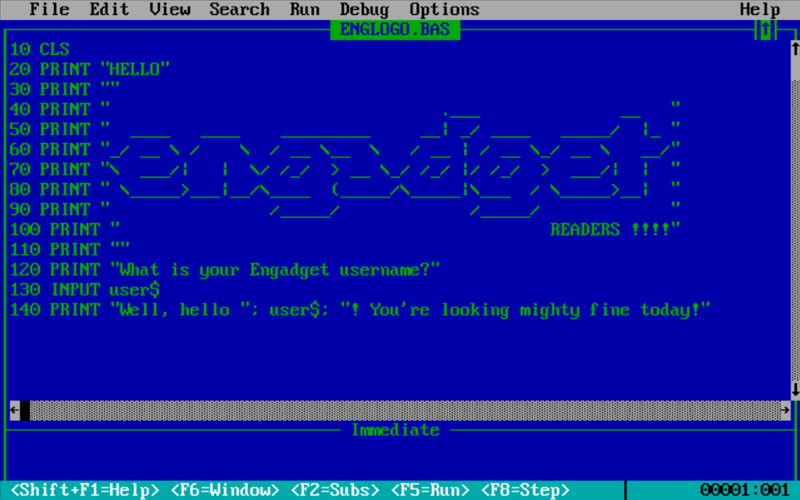 Programming itself hasgreatly evolved since, but our early memories of coding in BASIC are no less fond. 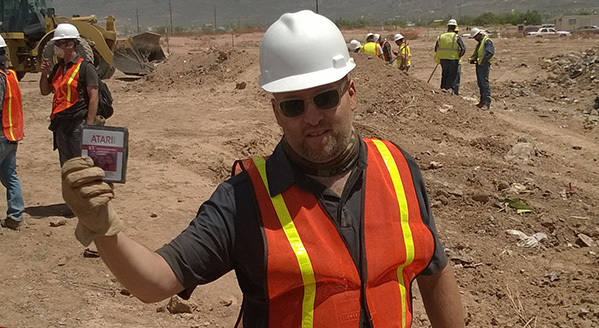 Xbox Entertainment Studios and Lightbox Entertainment's documentary on the excavation of a New Mexico landfill where supposedly thousands of copies ofE.T. : The Extra-Terrestrial for the Atari 2600 won't be completed for some time yet, but if you want to know how the search went, well, the above image should tell you all you need to know. Yup, they found E.T. - or at least one copy of the game. 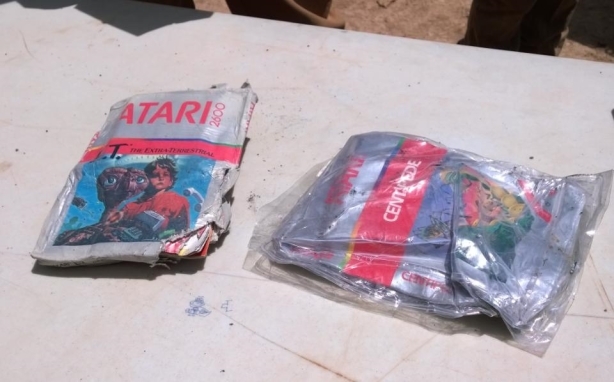 Xbox spokesperson Larry Hryb, AKA Major Nelson, tweeted pictures showing the cartridge, as well as other Atari 2600 games still in shrink wrap, from the landfill. Dude. Spoiler warning next time!